So, I know that my last post was a bit negative… not to mention weird… So here is a more positive (but still extremely weird, awkward, and the rest of it) post to balance that one out. Okay? So, let me set the stage. It’s evening in Tomorrowland in the Magic Kingdom. It’s absolutely beautiful weather, not too hot or too cold. Then nature suddenly decides, “No more Mr. Nice Weather.” It starts to POUR. All the sane people rush for cover, but a few (including me) seem delighted by this sudden turn of events and proceed to start jumping in the enormous puddles, splashing all the party-poopers. 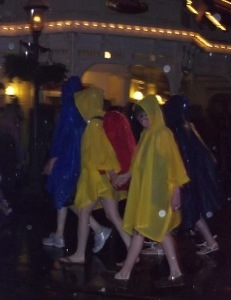 And how big were the puddles? Well, they seemed more like floods, and at least an inch deep in places. Once I was done making a complete fool of myself jumping in puddles, I took this rare opportunity to admire all the prime examples of poncho couture (it’s an art.). 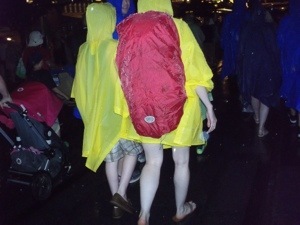 What’s the weirdest/coolest/funniest thing you’ve ever seen a tourist wear in a theme park? Let’s start out by saying: the less said about my most recent trip the better. So of course I have to tell you about it… to ensure you don’t make the same mistakes I did. Cue dark music here. 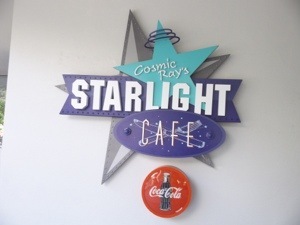 Cosmic Ray’s Starlight Cafe is a counter service restaurant in Tomorrowland, Magic Kingdom. I went there as a little kid, and still remember how there was an alien DJ who told jokes and sang. I didn’t really remember the food, but you know how kids don’t really care what they’re eating most of the time (as long as it’s wildly unhealthy). 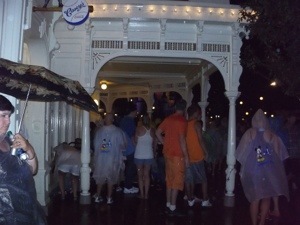 I specifically asked to go to Cosmic Ray’s to see the alien, so imagine my dismay when he wasn’t even singing! Or doing standup/sitdown/anysortof comedy. He just sat there. Ugh. Plus, I didn’t see anything on the menu I liked, so I ordered the kid’s “chicken nuggets.” I knew they would be gross as soon as I saw them; they came out looking burnt and generally disgusting. My mom even said that to the lady selling it to them. Mom: Uh, can we get another order of chicken nuggets? Those look burnt. Lady: No, that’s always how the kids’ chicken nuggets come out. So the moral of the story: when it comes to Cosmic Ray’s “chicken nuggets,” just say NO. Tucked away in a little corner of Main Street, U.S.A., Harmony Barber Shop is one of Disney’s best hidden gems. It’s got a quaint, homey feeling complete with potbelly stove and old fashioned telephone. The barbers themselves are some of the sweetest people on Main Street, always happy to chat with their customers. Harmony Barber Shop is great for all ages and genders. At three years old, I got my first ever haircut there, and I often see fully grown men stopping in for a trim. The services they offer include haircuts, trims, hairstyling, and pixie dusting. If you want, they’ll even give you a Mickey Mouse shape on the back of your head with pixie dust and Mickey shaped sparkles. You will LOVE Harmony Barber Shop! If you want a personal, old fashioned barber shop experience, get yourself over to Main Street. Even if you don’t want a haircut, head over for some pixie dust- you’ll be glad you did. 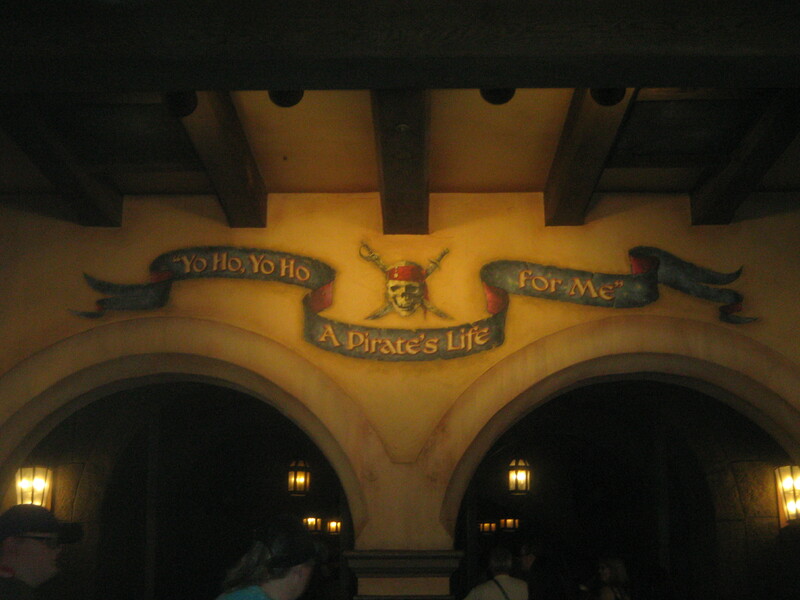 One of my all-time favorite rides in Disney World is Pirates of the Caribbean. 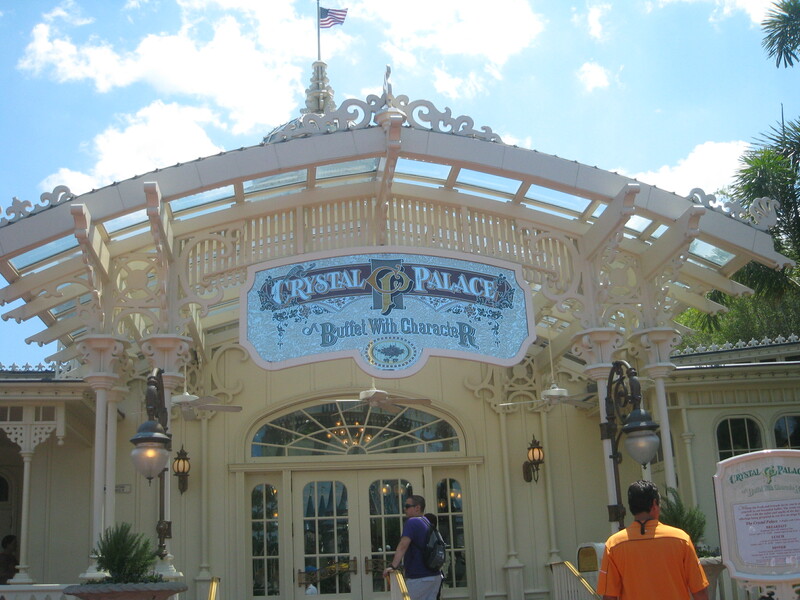 This ride wasn’t inspired by the movies – it inspired the movies! 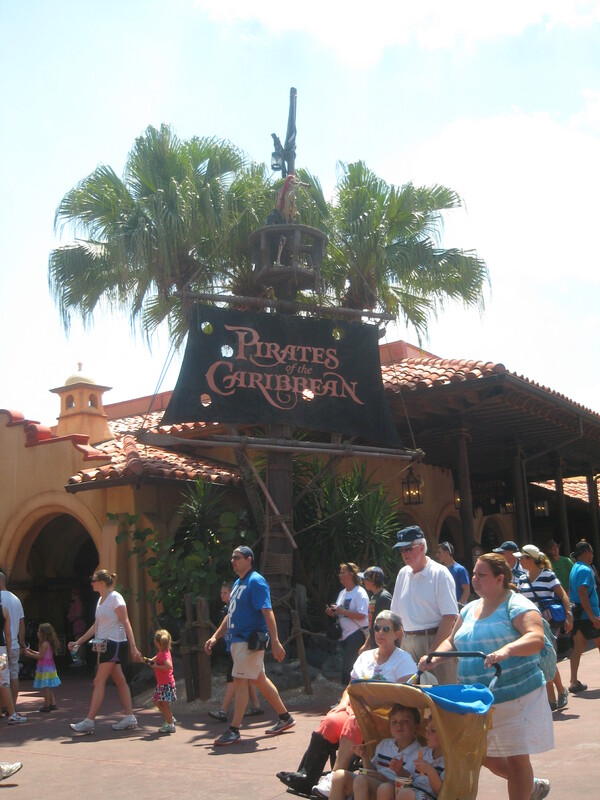 Later, specific characters from the Pirates of the Caribbean movies were added, namely, Captain Jack Sparrow. Much of the ride is in total or semi-darkness. Also, smaller children might be frightened by the multiple skeletons, fake fires, and cannonballs (Don’t worry, no one’s ever gotten hit with a cannonball- that we know of, that is.). 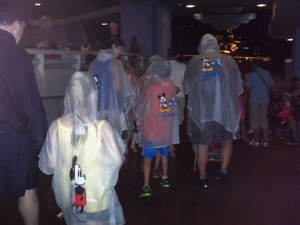 You might get a little wet on this ride, but not nearly as much as on Splash Mountain. Though you will not get soaked on this ride, there is a very short drop, a screen of mist the boat goes through, and the splashes from those cannonballs. I would recommend this ride for ages four and up, but it really depends on the child. My cousin was 2 when she went on this ride and she just smiled and waved at the pirates and skeletons (But she wailed when she saw the Tinkerbell and the fairies. How did that happen?). Guests in wheelchairs can ride, but those on scooters need to transfer to standard wheelchairs before boarding. 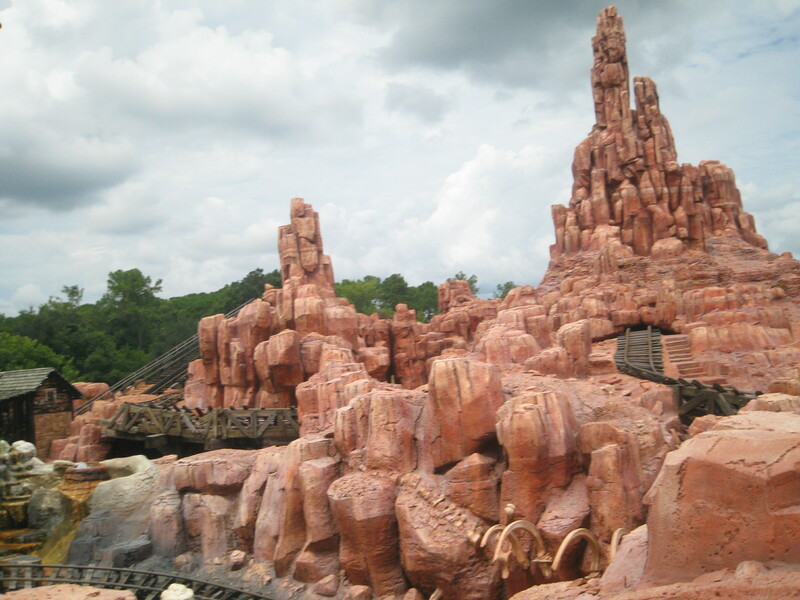 Big Thunder Mountain Railroad is a mine-train themed roller coaster in Frontierland. It sometimes goes underground and undergoes periods of darkness. The railroad then travels through a desert before arriving back at the starting point. It can be scary for younger children, but it is an exhilarating thrill ride. The lines are often over an hour long. Here’s an interview with my sister, Chrissy, who is nine years old. Pxzi: How did you like the Big Thunder Mountain Railroad? Chrissy: I thought it was fun and exciting. Pxzi: Was it worth the LONG wait? Chrissy: It really was! (but when you get off, you may feel kind of dizzy) I recommend getting Fast Passes. Pxzi: What is it like? Chrissy: Pretty fast but not so fast you’ll toss your cookies. It’s fun! Chrissy: A little bit when you’re underground. Pxzi: That concludes our interview! See you later! Splash Mountain is a fun log flume in Frontierland. It tells the story of a young rabbit who runs away from home in search of an adventure. He then gets captured by a fox, but he cleverly escapes and goes back to his family. The ride features the wonderfully silly “Laughing Place,” lots of singing animals, and the song “Zippedy-Doo-Da.” However, there are a couple of mildly spooky spots, such as the fox’s lair. Two people can sit in each row, so parents can sit with little children. As you float along the water in log shaped boats, you will experience several small dips and drops, plus one five story waterfall leading directly into the briar patch. All I can say is PREPARE TO GET WET!!! Here’s an interview with my seven year old sister, Rosie. Pxzi: What’s your favorite thing about Splash Mountain? Rosie: When you go down the BIG waterfall! Rosie: No, not for me. Pxzi: Did any of your valubles ever get wet? Pxzi: Is the line long? Rosie: Sometimes it’s REALLY long and sometimes it’s not long at all. Pxzi: Is it always worth the wait? Rosie: YES YES YES YES YES YES YES!!!!!!! Pxzi: On a scale of one to ten, how fun is it? Rosie: Superdy Duperdy fun! On a scale of one to ten, it’s 100 and a half! 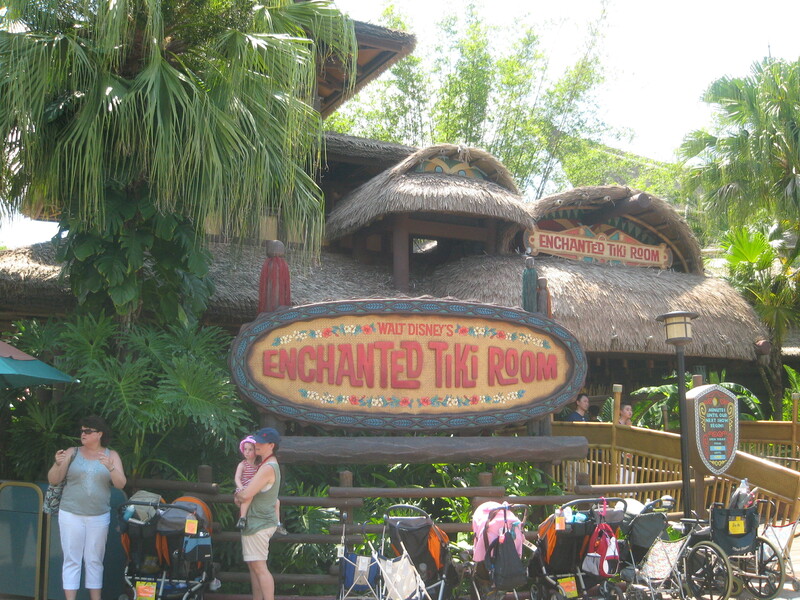 The Enchanted Tiki Room is a beautiful show in which birds of all kinds sing to the park guests. It was recently redone and taken from the rather more exciting ‘Under New Management’ version to the way it was when it first made its debut. My family found the change rather disappointing, but on the bright side, it is now much better for younger kids. Where before they might have been upset by the (I admit, kind of scary) appearance of Polynesia, the Hawaiian goddess of chaos, they are now delighted by the brightly colored birds. Unless your little one is afraid of birds, you needn’t have any qualms about bringing them to the show. When you walk in, you sit down on long wooden benches. No need to strap in, you won’t be going anywhere during this show! The birds sing a variety of well-loved songs, a few of which are accompanied by the tiki gods. The room is dimly lit, but not enough so to be considered dark. The ‘windows’ look out on stunning Hawaiian volcanoes. The show is concluded by a cute magic trick.